This Is a Bust! Astro Radio Z Tackles the VICE ACADEMY Saga! Once upon a time, in a glorious age called the early 1990s, the POLICE ACADEMY movies were finally good for something. Not the movies themselves of course, those had been going downhill ever since they entered their PG-era. But Rick Sloane, the awesome filmmaker behind HOBGOBLINS, MARKED FOR MURDER and MIND BODY AND SOUL did his own takeoff on the series and then ran with it for six feature films. VICE ACADEMY immediately had two things Gutterberg & Co. never did. And that was the legendary team-up of B-movie queen Linnea Quigley and former adult movie star Ginger Lynn (credited as Ginger Lynn Allen for her mainstream fare). Things were a bit more risqué in these films as the young women in the fictitious Vice Academy learned how to pose as prostitutes and bust drug rings. But though these were R-rated mainstays of the video shelves, the focus in Sloane’s films was always on silliness over sexiness. 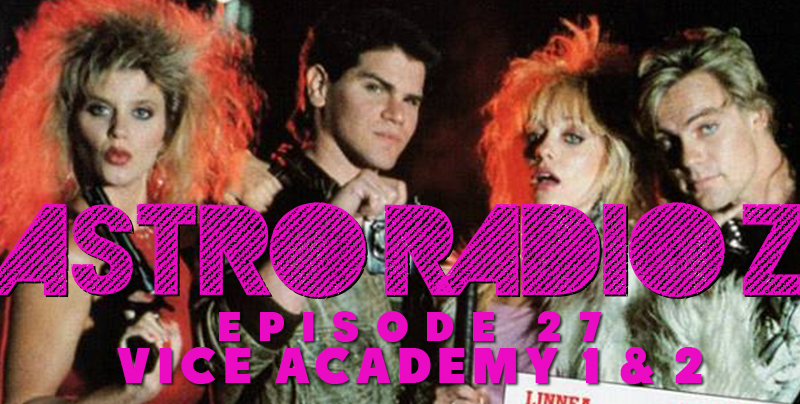 Derrick Carey (HOLE IN THE WALL) brings his Astro Radio Z podcast back as we start a series of three shows that will take a fun look at the entire VICE ACADEMY franchise. I am honored to serve on a talented panel that also includes Carrey, Brian Kirst, Glenn Buettner, Kate Owens, Mark Krawczyk, Andrew Shearer and Paul Salzer. The discussion focuses on the first two installments in the VICE ACADEMY series and is itself the first in a series of three podcasts. So, CLICK ON THE PICTURE BELOW, kick back and enjoy this very 18 and up discussion of the VICE ACADEMY franchise! Previous Previous post: JURASSIC CITY, or: Assault On Precinct 13 Million Years B.C.